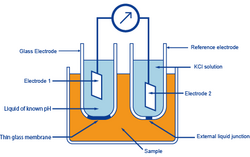 In the glass-electrode method, the known pH of a reference solution is determined by using two electrodes, a glass electrode and a reference electrode, and measuring the voltage (difference in potential) generated between the two electrodes. The difference in pH between solutions inside and outside the thin glass membrane creates electromotive force in proportion to this difference in pH. This thin membrane is called the electrode membrane. Normally, when the temperature of the solution is 30 ℃, if the pH inside is different from that of outside by 1, it will create approximately 60 mV of electromotive force. The liquid inside the glass electrode usually has a pH of 7. Thus, if one measures the electromotive force generated at the electrode membrane, the pH of the sample can be found by calculation. A second electrode is necessary when measuring the electromotive force generated at the electrode membrane of a glass electrode. This other electrode, paired with the glass electrode, is called the reference electrode. The reference electrode must have extremely stable potential. Therefore, it is provided with a pinhole or a ceramic material at the liquid junction. In other words, a glass electrode is devised to generate accurate electromotive force due to the difference in pH. And a reference electrode is devised not to cause electromotive force due to a difference in pH.